Part of my Lightroom library, now in LR6. I have more than 400,000 photos in my Lightroom libraries, most of them "raw" files. I've been using Lightroom, now Adobe Photoshop Lightroom, since the betas of version 1, way back in 2006. I bought a copy of LR the week it was released, in early 2007. Editing in version 1 was pretty limited and I found myself using Photoshop to finish off a lot of my edits. But with the inclusion of local editing in version 2, I've used Lightroom pretty much exclusively for my photo editing needs since 2008. I've convinced other photographers to use LR and I've taught classes on LR. I've been a huge fan and proponent of Lightroom for many years. I mention all of this to give what I am about to say some perspective. I am very close to being done with Lightroom. The decision is based on two things: Adobe's dreadful customer service ethic and Lightroom's slide in quality. The customer service part first. Adobe has essentially stopped selling software (at least professional software, Elements doesn't count). You can't go into a store and buy Photoshop, Illustrator, In Design et al any longer. Instead you have to join Adobe's Creative Cloud (CC) and rent your software. Stop paying for your software and you can no longer use it. That means if you start a project in In Design (for example) and save your work in In Design's native format, you won't be able to keep working on that project if you stop paying for CC membership. Your computer "pings" Adobe's servers every month to make sure your account is current. If it's not, you lose access to your software. This may not be an issue for people living in Europe or the U.S., where we're online all the time. But this is an issue for people in developing economies. Although it seems like I'm online all the time in Bangkok, it's very easy for me to imagine missing my computer's monthly ping to Adobe when I go to Laos or Myanmar for an extended period of time and not have regular internet access. No internet access means no access to applications. That's not an option I can live with. I don't have a problem with Adobe renting software to people who want to rent it. I have a problem with Adobe not selling software to people who want to buy it. Lightroom has existed in a strange no apps land. It's a professional product but you could either buy it or rent it. Your choice, as it should be. With the release of LR6, Adobe has pushed it more fully into the professional / CC sphere and made it much harder to buy. During my upgrade process, everytime I tried to buy the LR6 upgrade, the Adobe servers switched me over to the CC side and tried to force me into CC membership. With a good bit of dread, I ended up in a support chat with Adobe that felt like it was straight from the pages of Comcast. I told the customer service representative that I wanted to buy Lightroom 6 and specifically told him that I had no interest in CC membership or renting LR6. The customer service rep then proceeded to tell me why I should join the Creative Cloud ($9.99 per month, and it includes Photoshop) instead of buying the upgrade to LR6 ($79.99 one time, Photoshop not included). I told him again that I had no interest in renting my software and he said something like, "I understand but..." At that point, I cut off the chat and told the rep that I was absolutely not joining the Cloud. I told him that I had been a Photoshop user since version 2.5 (1992) but that the move to the Creative Cloud had caused me to abandon Photoshop and replace it with software I could purchase outright. I told him that I would move away from Lightroom if CC membership was only my option. After a little more back and forth we straightened out the issues with the purchase of LR6 and I completed my download. To my dissatisfaction though, I was still forced to download the Creative Cloud app, which is sort of a control panel that keeps track of your Adobe applications. What should have been 5 minutes with a simple link to a web page was 35 minutes with constant upselling. That experience alone soured me on continued use of LR. The slide in Lightroom's quality is harder to quantify. 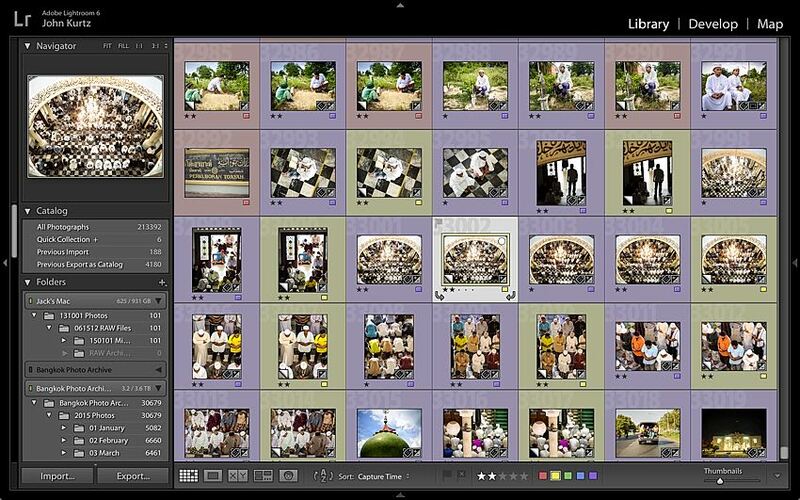 There are a couple of new features in LR6 that Adobe is promoting very heavily. Things like panoramic stitching and HDR compositing. They're well implemented and nice if you want or need those features. I'm not particularly interested in those features. I needed LR6 because it included compatibility with the Olympus OM-D E-M5 Mark II, the cameras I bought while I was in the US. Adobe claims LR6 is significantly faster than LR5. That is the one I take issue with. I am working on a tricked out new MacBook Pro Retina with 16 gigs of RAM and the 3.1ghz i7 processor. In the library module, Lightroom 6 builds thumbnails and previews a little faster than older versions. I credit that insignificant speed up to the tricked out new computer with its improved graphics card. The problem is that LR6 is significantly slower when I'm working in the develop module. It takes several seconds to load a photo into the develop module, and that's with a comparatively small 16 megapixel files from an Olympus camera. I can't imagine how slow it is with 50+ MP from the 5Ds or 32+ MP from the Nikon D810. When I'm done with a photo, develop settings hold, but the previews don't display them. I move onto the next photo and then go back to a photo I've processed previously, LR starts by building the original preview and then rebuilds the new preview. It significantly slows down my workflow. Some things that Adobe should have fixed years ago with LR are still problems. The first thing you need to do with LR (or any similar photo management application) is import photos into the app. Lightroom's import tools were state of the art when LR1 came out nine years ago but have been barely tweaked since then. If you work off of multiple cards, as I frequently do, and you rename your files when you import them (as I do) you need to reset the sequence number with each card you import because LR doesn't remember where you left off. If you work in RAW+JPEG, as I do, you have to import both the RAW file and the JPEG even if you don't plan to archive the JPEG. You can manually deselect files you don't want to import, but that takes much more time than importing them and then deleting them. Other photo management tools, like the excellent Photo Mechanic, have offered a very robust import tool for years. PhotoMechanic allows you to split imports into JPEG or RAW files, import off multiple cards at the same time and remembers the sequence number of your imports. It's long past time for Adobe to offer a similarly robust import tool. At this point my experience with LR6 has been horrible. I can no longer recommend LR6 as a primary photography workflow tool. If people ask me whether or not they should update to LR6, I ask if they have to update because of camera compatibility or if they want to upgrade because it's new. If they don't have to upgrade, my advice is don't. Maybe Adobe will fix LR6 with an incremental update, but I don't think they will. Moving forward I'm looking for options to Lightroom. I will probably start by looking at Capture One from Phase One. It has a dedicated base of users, but I have 400,000 photos in my libraries and switching photo editing applications is not a decision I make lightly. If you're reading this and have experience with Capture One I would love to hear from you.